The marine currents basically set the pattern for the Galapagos Islands' weather. The "garua" season, June to December, is influenced by southern currents coming along the west coast of South America moving towards the Galapagos. By the end of November, the trade winds are not as strong and the "rainy" season begins, due to the warmer currents coming from the west coast of North America down to the north of Ecuador and again due to the Coriolis effect they turn to Galapagos making the surface of the ocean warmer all over the Galapagos and increasing precipitation, however these rain showers last for no longer than an hour leaving the rest of the day sunny, warm, and beautiful. 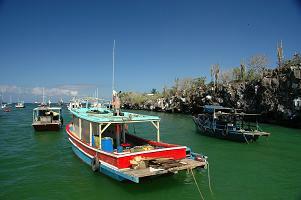 In general there is no bad time for visiting or fishing the Galapagos Islands. There are over 450 species of fish in the Galapagos Islands, and about 17% of these are endemic (not found anywhere else in the world). The Galapagos Islands, due to their location are a migration point for all varieties of pelagic (ocean surface) feeding fish, Galapagos is definetly a true bill-fish spot offering great opportunities for all Marlins, Black, Stiped, and Blue. Striped Marlin: February - June, believe it or not, could go from 10 to 50 a day, this is the peak season however you can catch Striped Marlin during any month. Blue Marlin: Mid-March to late August is the highest season but just as Striped Marlin, you find it any time. Black and Yellow Fin Tuna, as well as Wahoo, and Dorado(Mahi-Mahi). Itineraies are available from 3, 4 and, 5 days, please contact us for details.